A warm welcome and complimentary whisky awaited the 400 delegates at the city’s convention centre from new member airline Loganair. Scotland’s longest serving airline has only just joined the ERA family, but it made up for its absence, scooping Gold Airline of the Year, recognised for the phenomenal change the business has undergone to become Scotland’s independent regional. At the gala dinner returning industry founding father Scott Grier, congratulated CEO Jonathan Hinkles on doing a fine job. The airline has recently moved into ERJ-135 operations and adds an EJ145 next month. It is also planning to start flying from Glasgow to Germany next summer. Amid all the jitters of Brexit, it was a celebratory night for the Brits. Binter Canarias took silver, but a hugely popular Bronze winner was Titan Airways, marking its 30th anniversary and the original pioneer of ACMI and charter activity. Consistent profitability and an intense two-week flying programme last autumn, repatriating some 80,000 passengers back to the UK and Europe when Monarch Airlines shut down were cited as reasons for the accolade. Jon Horne, stalwart (ERA’s words) of UK regional airport operations at London City Airport; Sheffield City; Cardiff and latterly Southend was given the DG’s award for Personal Excellence, while Ireland’s Shannon Airport, for the third time, was named airport of the year. 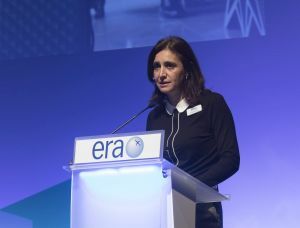 ERA retains a strong voice. Its boasts 50 airlines among its 200-plus membership; complemented by 22 airports; 119 suppliers; 11 aircraft manufacturers. The airlines may be doing more ACMI and charter flying than scheduled activity today, but collectively these carriers fly 74m passengers a year, are present on 1.800 routes and operate a combined 730 aircraft. 56% are jets. The sector contributes €52bn to the economy and some 300,000 jobs. Edinburgh’s gathering flagged up rising fuel prices as a new concern. Prices are up an average 30% and airlines that have not hedged, face profitability hits, delegates heard. Delays, ATC and strike action, especially in France, has hit the industry hard. Consolidation continues apace with Spain’s Air Nostrum and CityJet the latest to partner. VLM and SkyWork Airlines are no more and Swiss airports Bern and Lugano are actively courting new operators. Access and capacity are concerns while trade wars and tariff barriers threaten to hurt economic activity, making the overall picture a challenging winter all round. ERA will lobby for a comprehensive agreement that includes traffic rights, pilot licences, security agreements, leasing conditions that hopefully mirrors today’s situation as much as possible.” Aurigny CEO Mark Darby, opined that regional airlines are a revolving door as regards employment. Skilled engineers that could come to us are getting paid better in IT and they don’t have to work outside in the rain. We are merely flying schools for the big airlines added TUS Airways Michael Weinstein, adding the whole sector is guilty of not investing enough in apprentices. He also shared some frank comments on EU 261, the one ruling the UK CAA has agreed to keep! At a press briefing Embraer confirmed a previously undisclosed Spanish airline has firmed up an order for five Embraer E2s. 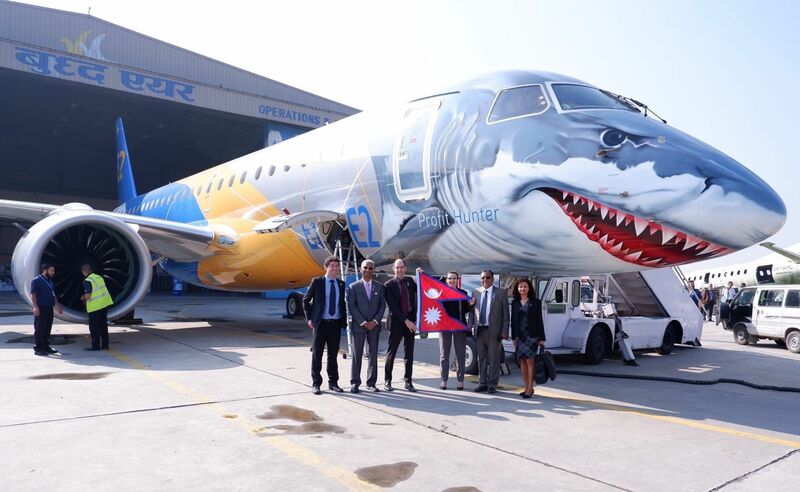 The global tour of its E2 demonstrator in distinctive profit hunter shark livery is moving on to Asia and China. Kazakhstan’s Air Astana accepts its first of five E2s in November. Embraer didn’t have anything to add regarding its strategic Boeing pairing, but highlighted its own market share has widened to 29% of the single aisle market with 1,400 aircraft in service with 70 airlines from 50 countries. The E2 is a great choice for existing E190 operators, where the transition training time for pilots is a mere 2.5 days. Bombardier highlighted its Q400 large turboprop is becoming increasingly popular in higher density spec. ‘Upgauging turboprops’ is how Colin Bole. Head of commercial, describes it, highlighting Spice Jet in India took the aircraft in a 90-seat layout in September. Repeat customer Ethiopian specified 82-seats; Nok Air and PAL 86 seats. 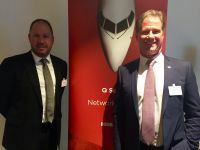 ACMI and charter is a growing trend with some 46% of its regional jet customers in Europe selecting the aircraft for such missions, said VP Ryan DeBrusk. Fleet leaders in such a role are SAS, Iberia, Air Nostrum, CityJet and Adria – contributing some 9,000 flights a week, 66% up on flights last year. With the average European regional aircraft sized at 80 seats, media attendees wanted to know about future demand for smaller turboprops. Would they build a new smaller aircraft? Seat mile costs are not so different between 30 to 70 seater but any all-new aircraft will have to take advantage of new technologies – hybrid/electric aircraft, as Siemens are doing in the GA sector. This technology is not expected to filter upwards to regional aircraft under 2030, however. Loganair is investigating an electric-engined Britten-Norman Islander to replace its aging aircraft on the Orkney routes and has already mooted the idea in Scottish Parliament. A number of embryonic programmes are currently in works at Cranfield, which is leading the way in disruptive technologies in the UK. The Islander project is being targeted for 2021, Jonathan Hinkles said. ERA Edinburgh saw the return of Steve Ridolfi, ex-president of Bombardier Commercial Aircraft. He is back (having been away for 10 years) leading Irish/Canadian regional aircraft leasing company Chorus Aviation Capital. Head of ATR communications David Vargas was absent, having just left for a new role at Airbus and Simon McNamara, after less than a year with Flybe, was in Edinburgh representing IATA. Mark Dunnachie, most recently CCO of leasing company AerFinn and one time Embraer is ATR’s new head of commercial EMEA. Lone Koch, daughter of another industry founding father Ingolf Nielsen was in Edinburgh. She is now CEO of Air Alsie Express, an ATR airline which works in close cooperation with its sister and AOC holder Air Alsie which runs a 22-strong executive aircraft fleet.